Chambord Liqueur is a 16.5% abv raspberry liqueur modeled after a liqueur produced in the Loire Valley of France during the late 17th century. The Chambord product brand has been owned and produced by the Brown-Forman Corporation since 2006. 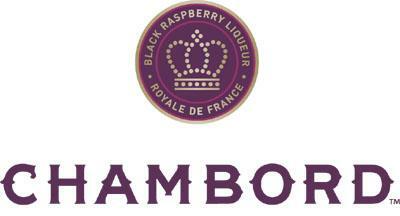 Chambord is made from red and black raspberries, Madagascar vanilla, Moroccan citrus peel, honey and cognac. Whole raspberries and blackberries are steeped in French spirits for a period of several weeks to produce a fruit infusion. After the infusion is extracted, a second set of spirits is added to the fruit and allowed to rest for a few weeks. After this second infusion is drawn off, the remaining fruit is pressed to obtain the natural sugars and juice. The fruit-infused spirits and juices from the final pressing are then combined, and finally, the berry infusion is married with a proprietary blend of cognac, natural vanilla extract, black raspberries, citrus peel, honey, and herbs and spices.